Moritz Freund was born in Bohemia, in 1810. Jetta (Henrietta) Freund was also born in Bohemia, in 1821. In Bohemia, Moritz Freund was trained as a baker. Moritz and “Jetta” Freund left Bohemia for America after 1848. When they first settled in St. Louis, Moritz Freund worked as a dry goods peddler. Around 1856, the Freunds lived at 913 Soulard, a home with a wood burning stove. What began as the daily chore of baking bread for her family, turned into a bakery business called the Freund Baking Company. They sold “Old Tyme Rye” bread — a Bohemian-style rye — in St. Louis grocery stores and, later, countrywide. The bakery was located at their Soulard home for more than 60 years. In the beginning, the wood for their oven was supplied by a struggling farmer, Ulysses S. Grant. During the Civil War, General Ulysses S. Grant, “commissioned” them to sell their bread to the army at Jefferson Barracks, which they did until the post closed after World War II. Freund’s Rye Bread was featured in every pavilion of the St. Louis World’s Fair. In 1921, the Freunds opened a new bakery at Taylor and Chouteau. 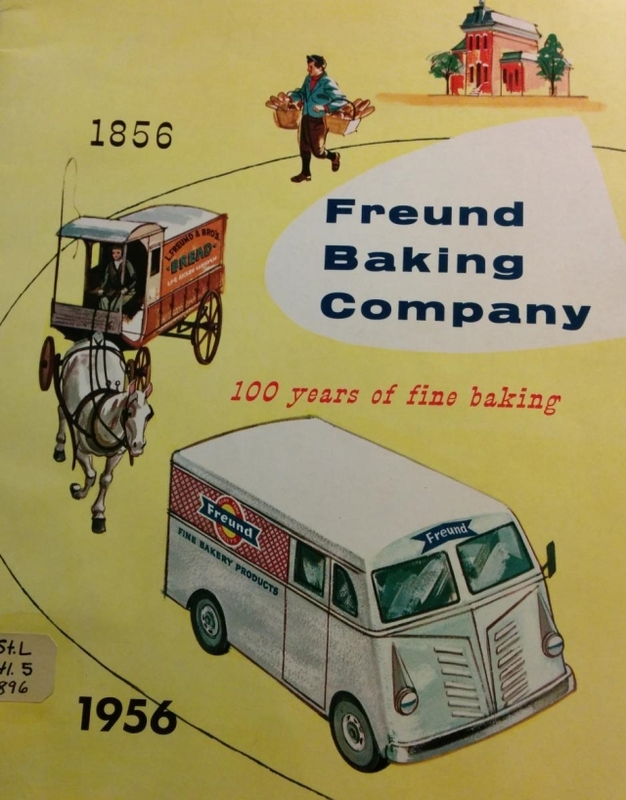 The Freund Baking Company remained family-owned for 4 generations, until it was sold to a large food corporation in 1972. The Freunds were charter members of B’nai El Temple. Moritz and “Jetta” Freund had seven children: Leopold (b.1845) and Simon (b.1848-1931), Caroline (b.1852), Laura (1853-1868), Siegfried (b.1857), Emelie (1859-1869), and Bertha (b.1862). Moritz Freund passed away in 1872. Jetta (Henrietta) Freund passed away in 1863. Ellen Jane Freund Schwartz, Freund Family Chronicles (St. Louis, MO: 1992). Samantha Silver is curator of this Moritz & Jetta Freund exhibit.